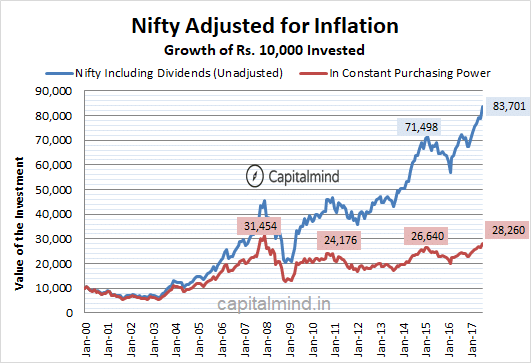 The Nifty has gone up 8x since 2000 (including dividends reinvested), and has nearly doubled since the highs of 2007, something strange happens when you adjust for inflation. Adjusted for Inflation, you would have less today than in 2007! Even though markets are at new highs and above 10,000 on the Nifty, we still aren’t in the mad euphoria that was 2007. Adjusting for inflation, we still have a way to go before we can say “all time high”.